1. 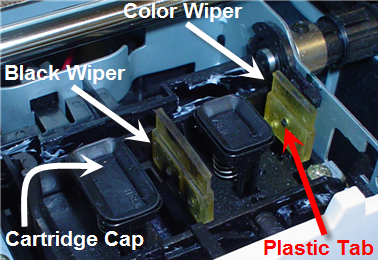 Check the Maintenance (Capping) Station for ink build up / Replace Wipers. The capping station is where the cartridges dock when not printing. The rubber cap just naturally builds up ink over time. There can also be ink residue on the wiper. Wipe off the capping station components occasionally with a damp cloth. The components that need cleaning include the cap itself as well as the two clear plastic wipers just to the right of the cap. See the images below. The color wiper may actually need replacement after several thousand prints if you notice light printing on the first few passes or leading edge of the label or disc. Request a new wiper from tech support. To replace it simply use a screw driver to bend the wiper so the hole in the wiper clears the plastic tab on the maintenance station. Pull the wiper from the maintenance station. 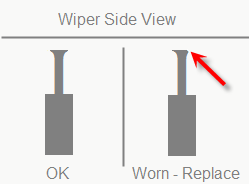 Replace it by pressing the wiper down until the plastic tab fits into the hole on the wiper. If you have recently changed the image sharpening value to "12" as described in this article you may need to change it back to "11". If this problem continues to happen you may need to switch between these values. Use "12" for partial coverage prints with black text or graphics. Use "11" for full coverage prints. Finally, if printing is still light at the beginning of a disc, the following configuration file can be edited. Open the PT_DPPro.ini at this location. Find the Extra maintenance section in this file. Remove the semicolon in front of the ExtraMaintenance Key. Set the value accordingly. The higher the number the more maintenance between each print. 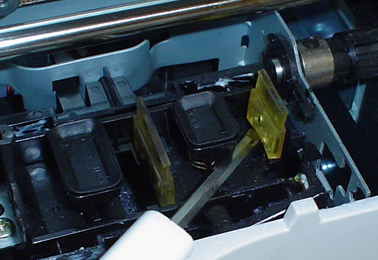 Note: Maintenance is basically when the ink cartridge spits ink or swipes the wipers to ensure the ink is free flowing before it starts printing. Higher numbers will cause ink to be used at a faster rate. Start with 1 and work your way up. At what point does the BravoPro, XRP, or SE warn for low ink? Can warning points be adjusted?